Didn’t get to write a blog during the week, was a busy one. Btw, the Miami trip for the fundraiser was magical. We raised enough to not only give a sizable donation to the American Foundation for Suicide Prevention, there’s also enough to establish a modest scholarship in Rory’s name for a college bound artist. Despair does not win. So, this is one of those times when I just sit down and wing it. Not that there haven’t been several topics floating around all week, but nothing solidified. So, I’m stepping up to one that seems, after the past week, to be a fastball down the middle, just waiting to be cracked. As I’ve shared in past episodes, I’m a confused Catholic. Don’t agree with a lot of what they say, but no matter how many different places I’ve looked for the right voice, I’m continually drawn back to that touchstone. Not so much for the voices, (to cut them a break, truly inspired voices are hard to come by,) more for the place. But in reality, for me, it's not about "religion", it's about inspired leaders. When I run across one, I take note. There are lessons to be learned. That brings me to Jorge Mario Bergoglio, aka, Pope Frances. His six-day visit to the U.S. was a whirlwind of wisdom. Everywhere the man spoke, he offered crucial instruction; and it had absolutely nothing to do with religion. It was pure life stuff. Love stuff. I read the transcript of his address to Congress and was blown away. It’s no wonder John Boehner got choked up. He was listening. I wonder if anyone else heard themselves being called to task. (I applaud Mr. Boehner for acting on the directive. He was planning on resigning in November, but was so affected by the instruction he saw no reason to wait, saying the Pope’s words helped “clear the picture.”) I haven’t read all of his addresses yet, (I intend to,) but the pulled quotes for news stories are unmistakably inspired thought. The man is a speaker of truth. He’s one of the voices. More and more I’m realizing we’re facing a time of change; perched on a precipice, teetering between the safety of light and the agony of dark. Are any of you following the HONY series on the refugees? Wow. The first man’s story, talking about his Syrian family’s escape from ISIS, is unimaginable. A family torn apart by atrocities and savagery; gored by the pain of their brother’s head being delivered in a box. The father beaten so badly, he had to be hospitalized. Cruelty lining their path to escape. It reads like a horror story. No. Despair does not get to win. We need to start listening to the voices. Those who rest in reason; connected with what is decent and of a common human concern. That’s been a favorite bit of instruction for quite a long time, “To each person, the manifestation of the spirit is given, for the common good.” I've said it before, our gifts are supposed to work together as a whole; not tear each other apart. 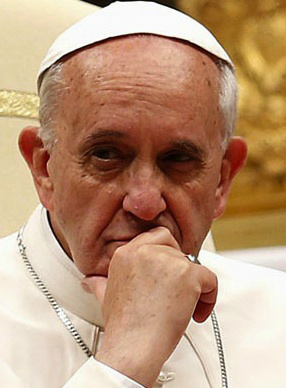 I was so encouraged to hear the Pope make reference to a “common human concern” so many times. Adopting it is key. How foreign that concept is to American politics; as an institution, it’s all so broken and self-absorbed. The approach is to expect the worst in people instead of seeing the best. They need to heed Francis’ words and open their eyes. They’re fostering a culture of people who pass judgment; harnessed by the yoke of self-righteousness. Weighed down by the need to be right. Boehner made reference to their ilk. False prophets. Those are the voices that need turned down. I’m listening. The Pope changed my thinking about a long-standing conundrum. He visited prisoners at the Curran-Fromhold Correctional Facility, in Philly; met with inmates and their families. (Posted a link to a great article about it below.) There were about 75 inmates involved, and he made personal contact with each of them. (The writer made a sharp distinction between him having to check the box of time with politicians and the rich and famous, and the visible difference when he was with the homeless in D.C., or the children of immigrants in Harlem, or inmates in the prison, he came to life. This guy is the real deal.) My conundrum? The death penalty. I’ve never known which side of that fence I sit on. There are compelling arguments for both. But between his visit to the prison, and his comments regarding the subject, he’s made the most convincing case. That shouldn’t be in our hands. It perpetuates the lie that people can’t change. There’s a quote in the article I have to repost, his voice needs to be heard loud and clear with this one, “ ‘Any society, any family, which cannot share or take seriously the pain of its children, and views that pain as something normal or to be expected,’ said Francis, ‘is a society ‘condemned’ to remain a hostage to itself, prey to the very things which cause that pain.’” We desperately need to listen to this voice. Catholicism has nothing to do with it, he’s speaking to all of us. There are more voices out there; some who’ve been around a long time and some who’re immerging now. Kahlil Gibran has been a long-time favorite. What a unique and beautiful voice he has. For the longest time I kept a copy of, The Prophet, on my bedside table. Had to smile when they were touring General Schwarzkopt’s barracks, during the Gulf War, and he had a copy of it on his nightstand too. Gibran’s words are important enough to take to war. Especially the passage, “Children are the sons and daughters of life’s longing for itself.” Life longs to be fulfilled. If we listen to the voices, it can be. Jorge Mario Bergoglio chose his papal name after St. Francis of Assisi; there couldn’t be a more fitting way to end than with his voice. The words are taken from the same prayer John Boehner read when announcing his resignation.